HAMMER FIGHT Debut New Song "Target Acquired"
HAMMER FIGHT are a bunch whiskey-drinkin', beer guzzlin' bros who spawned from New Jersey. 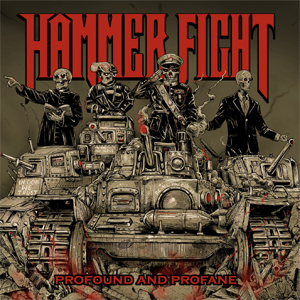 HAMMER FIGHT will release their Napalm Records debut Profound And Profane March 25th. Today the first single from the album, "Target Acquired", has been released and you can check it out below. "We couldn't be happier to FINALLY unleash some new music! "Target Acquired" sums up the general feel of the new album pretty accurately. It's a fast paced, thrash ripper with lyrical content (most of which I wrote at the liquor store) that is very close to our hearts and we feel most people could relate to. So crank it up, play on 10 and blow your speakers WITH ROCK N ROLL!!" Profound And Profane is available for pre-order in physical formats HERE. Digital pre-orders are available HERE and include an instant-grat track of the song "Target Acquired". "Good Times In Dark Ages"
"Gods Of Rock N' Roll"